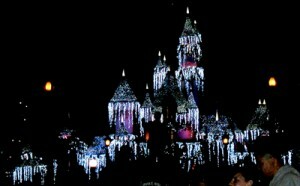 Holidays in Disneyland…can it get any more magical? 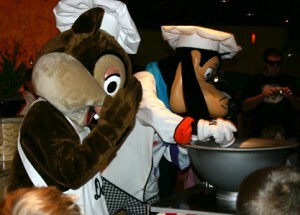 Dance and cook with Goofy and his friends in Goofy's Kitchen! Brilliant fireworks, beautiful music, and a snow fall surrounded by white lights all combine in the Disney fireworks display to bring the holidays home! Are you planning any trips to the Magic Kingdom this holiday season? If you are not, then you should! Holidays in Disneyland are truly magical! For starters, it’s pretty tough to find someone that could top the Mouse for his decorating savvy. The entire park gets a serious make-over for the holidays. Toon Towne is complete with snow on the rooftops and you won’t even recognize the Haunted Mansion, which has been overrun by Jack Skellington and his band from the Nightmare Before Christmas. The towering trees, wreaths, flowers, and holiday lights are truly a sight to behold. If you can’t get in the Holiday spirit in Disneyland, then I am afraid there is little hope for you. Transportation. If you have the ability to take the monorail into the park, this will shave considerable time off your morning commute. You must be staying in a Disneyland Hotel (California Hotel, Paradise Pier or Disneyland Hotel) in order to fast pass onto this little gem of a transport system. Presenting your room key along with your park ticket will get you in a full hour before the park opens on select days. Food and the “bottom” line. If you plan to be in the park for the entire day, food can be a very daunting expense and major time waster. Again, we are addressing those with little ones here. Based on considerable experience, we recommend you try to limit yourself to two or less meals in the park. Snack before you leave your room. Then eat a good sized breakfast in the park late in the morning (you can hit the rides while everyone else is eating at normal breakfast hours, then eat while the ride lines are longer) then take along a smorgesborg of water, treats and snacks (fruit roll-ups, trail mix, granola bars, fruit, etc.) that will happily tide your little ones (and bigs ones!) over until the next meal. Skip the lunch and have either an early dinner or a late dinner. Again, this helps you avoid the mealtime crowds and time-waster lines. Don’t miss the fireworks! You need to give yourself a good hour before it starts to find a decent spot. Take some blankets to sit on. Pick a spot near the castle or near the Small World ride. These are the best locations to be a part of the “White Christmas” part of the fireworks…yes, there is actual snow that will fall! You won’t want to miss it! Give the gift of memories! If you’re going to spend all that money on getting your family to the park, then it’s worth it to make sure they remember it, right? Autograph books can help you’re kids interact with the characters firsthand and have some memories to boot. An autograph book that includes picture slots is a must. Our little ones loved to approach each character and “ask for their autograph”, if only to have an excuse to talk to the character one on one. Once finished with the trip, we insert photos of each child with their character friends into this autograph book and it becomes a real treasure for each child. A word of advice for the autograph seeking crowd…it is well worth investing in a “character dining experience” rather than face long lines to meet each character in the park. For the best food and character quantity, we recommend the “Plaza Inn “Minnie & Friends – Breakfast in the Park” hosted by Kellogg’s ” inside Disneyland for breakfast. In one hour, you will fill up at least half of an autograph book. Good luck on your Disney vacation and we hope you have as much fun as we did! Now go make some memories! Do you have experiences or tips you would like to share about how to maximize a Disneyland holiday trip? Visit our forum and join in the conversation!